Last Friday, my workmates and I went to Ninniku Jip. Ninniku Jip is a Korean & Japanese (more to Korean) restaurant located at Albany Hwy, Vic Park. Judy was on a HIGH mode that day. She ordered warm sake for us to share. Us, I mean me and Judy. Apparently sake taste like Vegemite to Christine and Brooke. I only know sake made me LAZY the whole afternoon til evening! We had the Tempura Chicken Pops which I think they just uses the packet of frozen chicken balls from asian grocery shop, coat it with flour, fry it and drizzle with Japanese bbq sauce and Japanese mayo. Mains, Judy treated herself really well. A sizzling seafood dish with some sides, soup and rice. Christine had the Fried Kuey Teow. I know this is not Korean nor Japanese, but somehow it was in the menu. Brooke had the Garlic Chicken Bulgogi. Surprisingly enough that none of them actually like the Kimchi. 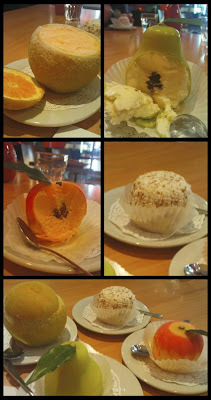 I'm starting to wonder.. am I a bin that eats everything..... 0_0"
Anyway, we had a beautiful dessert. No, I'm serious. It's beautiful dessert.